on July 25th at the Arts Center, Melbourne, MCN chief sales & marketing officer, Mark Frain shares his views on addressable TV. Tickets here. A few weeks ago I was part of two collaborative industry events. 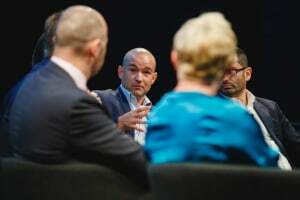 One included some questionable tattoos - Adland Bailout - and the other a gripping panel discussion with fellow media owners about the future of TV advertising at the AdNews Media + Marketing Summit (Sydney). Myself, the sales leaders of Seven, Nine, plus ThinkTV boss Kim Portrate and Publicis CEO Matt James sat together on the stage and while we agreed there is certainly huge opportunity in addressable TV, the reality of large scale delivery for Australia still remains a work in progress. As Nine’s Michael Stephenson argued, there is technical complexity in delivering 'one-to-one' advertising to consider, not to mention, as I stipulated, the need to ensure we get the balance of viewer and advertiser experience right. Seven's Kurt Burnette also cautioned the audience about the need for reach to be delivered alongside addressable, and its promise of 'one-to-one'. Addressable TV has been the subject of many discussions for a solid six months in Australia, but it’s important to note we’re flying awfully close to the sun in terms of our capabilities to actually deliver the Holy Grail. The same can be said for global players trotting out similar claims. Because we can add layers of data, audience and campaign attribution that were previously not possible, addressable TV has a blue-sky opportunity to reaffirm the effectiveness of TV better than TV has ever been able to, but we must be cautious of promising utopia too soon. In fact, we’re in danger of an arms race to overpromise and position before we actually have a robust and real product with scale. This is a collective responsibility for both media owners and agencies. Furthermore, when we combine this with the latest headlines around GDPR and it’s yet-to-be-determined local impact on multi-nationals, plus greater data privacy compliance scrutiny than ever before, we may be legally forced to proceed with caution. Ultimately, it comes down to how we define addressable TV and ensuring we don’t disappoint advertisers and damage its long-term credentials by slapping on a new, shiny name for targeted online video ads. Better targeting works when the segmentation remains scale-able to deliver on business objectives. For me, there are three phases of addressable TV advertising: Programmatic IP and Linear TV trading; IP device-level mobile and connected TVs targeting and TV set top box targeting. Real addressable TV across these definitions is underpinned by several critical capabilities – robust audience, campaign and business attribution science, professional content and credible data layers. Although we are making headway in some of these areas, particularly with Oztam and ThinkTV, unfortunately, at present, a surface scratch of the Australian addressable TV market on these parameters would come up a little short. So, as such, although there is some exciting work which will come to fruition in time, I urge caution against over promising market expectations for addressable TV’s current capabilities too early. Addressable TV has unquestionable potential to be one of the most powerful developments for TV advertising in decades, so let’s be careful not to risk the real benefits, not to mention make sure the product and advertiser experience can credibly deliver better-defined audiences across professional video content. Plus, empirically prove it delivers better business results. From here, we can then properly develop our addressable product and then align our ID and segmentation datasets to create genuine market scale. By doing this we can ensure quality customer and prospect targeting, that attribution can be credibly delivered, which in turn means addressable TV has a very strong future. As I mentioned that Friday at the summit, TV will remain the most powerful medium, but it’s just gotten a whole heap better. So, let’s all strive for our addressable TV journey to be a non-virtual reality and give it the best shot possible. Mark Frain will appear at the Melbourne Media + Marketing Summit on July 25th at the Arts Center. A full program can be downloaded here. Early bird tickets are still available. Ahead of the AdNews Melbourne Media + Marketing Summit on July 25th at the Arts Center, Melbourne, MCN chief sales & marketing officer, Mark Frain shares his views on addressable TV. Tickets here.